Mauri Pelto volunteered at age 22 to audit our glaciers — for the next 50 years. He just finished year 33, and his data set has become a prime exhibit in the climate-change wars. Mauri Pelto certainly didn’t set out to be a chronicler of loss. He’s an environmental scientist, trained to study ecosystems and life. So when he volunteered for an extraordinary lifelong project at the idealistic age of 22, he had no idea he would become a sort of town crier of decline. “I didn’t anticipate I would ever be seeing this level of demise,” is how he puts it. What actually happened was hardly so flippant: Pelto pledged to walk the same Cascade glaciers for 50 consecutive years. The task was to measure the thickness of the ice, the water outflows and the distances the glaciers had moved. What mattered was the big picture, so it was crucial that he stick to it, and do it year after year. On Tuesday this past week, he finished year number 33. For the first couple decades, it was old-fashioned scientific legwork in almost total obscurity. Our glaciers were losing mass in total, and had been for decades though at relatively slow rates. But then around the late 1990s, it all took off. The past three years, the rates of loss have been off the charts. Some glaciers have lost nearly 20 percent of their volume just since 2014, Pelto says. In total since he started, the glaciers have lost up to a third of what was there in 1984 — an average of 65 feet of thickness gone across all the North Cascades glaciers. According to National Park Service geologist Jon Riedel, this is equivalent to a 100-year supply of stored water for the Skagit Valley, gone. Pelto eventually became a professor at tiny Nichols College in Massachusetts, but he comes back every summer to audit the ice. What’s fascinating is how his steady, incremental work has become a sort of canary in the coal mine. He isn’t studying climate change directly (he’s not a climatologist). But over time, his chronicling of the acceleration of glacial melt has become a prime exhibit for what’s happening out on the ground. Of the glaciers he’s monitoring, Pelto says Columbia Glacier, north of Skykomish near Glacier Peak, is melting so fast it’s likely doomed. 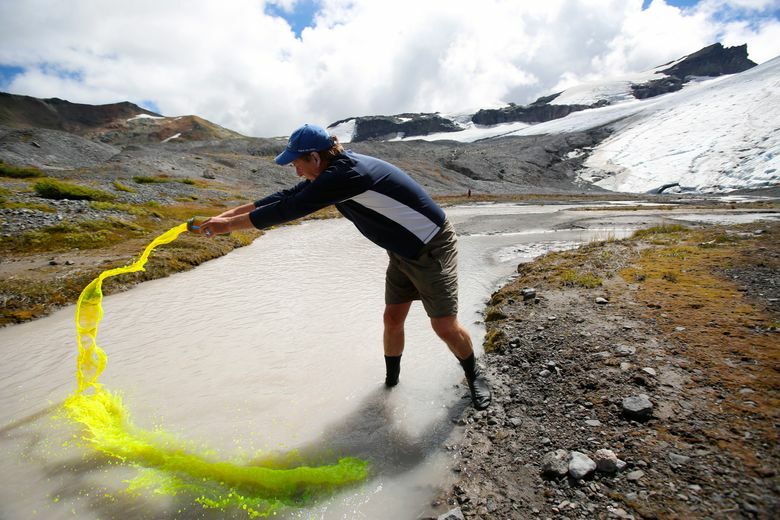 He’s seen half a dozen smaller, low-elevation glaciers die since he started. Overall, our glaciers lost 5 to 10 percent of their volume last year alone — the largest one-year loss measured. This year it’s about a 3 to 5 percent loss. The last time the glaciers gained appreciable ice volume was 2011. They have lost volume in 23 of the years Pelto has been auditing them and gained it in 10. But the losses have overwhelmed the gains by more than seven to one. “There’s something unnatural happening,” Pelto says. I asked Pelto what it’s been like to painstakingly compile all this numerical and visual evidence, for 33 years, yet during that same time have the political system often mock that any change is happening at all. Pelto said the know-nothing aspect of it is frustrating, but he’s got an outlet. Namely, he’s got 17 more years to walk the glaciers. The phrase “moving at a glacial pace” is supposed to mean going slow. But now the glaciers are moving faster than we are.